The last bit of building before we cover the ongoing Build-along Mini Fokker D-VII project is to make and install the wire landing gear. Here’s how I do it! Here’s the bacis tools and materials! You need your music wire, a 40watt soldering iron, Silver solder and liquid flux (I use Stay Brite), and some copper or galvanized steel wire to wrap the joints. Sand paper and a little solvent (alcohol or motor cleaner spray) and the required screws and attachment tabs. I start by drawing out the front views of the front and back wires. Here you see the struts and the axle wire laid out so iit will be straight and centered side to side. 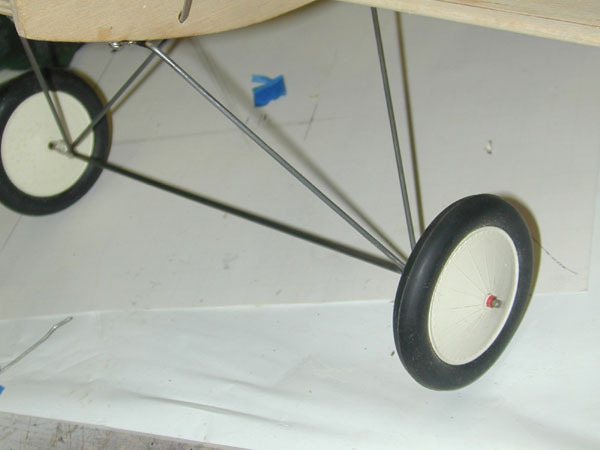 The axle is 1/8-inch wire and the struts are made from 3/32 inch wire. Get the distance from the bottom of the fuselage and the axles as well as the angles for the struts wires from the model plans. Cut the axle wire to length and debur the ends. I use a heavy duty wire cutter for this! To form the strut legs, I center the length of wire over the centerline of my drawing and use tape so I can mark the centerline and the first two bends on either side. Here the tape covered wire is placed in my bench vise so the bend line is even with the end of the vise jaw. Notice I have copper flashing face guards in the vise so not to mare the surface of the wire being bent. With the first two bends completed, place the wire on the guide drawing and make sure the wire lays flat on the work surface. You can’t make a straight landing gear with crooked wires! Now add more tape at the next two bend sections and repeat the process. A trick to making the axle attachment sections level and parrallel to the fuselage is to bend each section while eye-balling fuselage attachment section. When you bend the wire, if the fuselage section is vertical up and down, the axle attachment areas will be properly aligned! See illustration above. Once you have all the bends complete for both the front and rear strut wires, attach the wire to the fuselage. Here I use formed metal attachment tabs and sheet metal screws to attach it to the plywood hardpoint plate. Checking the alignment several times, bring the wires together at the solder joints and wrap with the copper wire. Use sandpaper and solvent to clean the joint areas. The wire should be nice and shiny. Apply several drops of flux and apply heat. Apply the heat to one side of the joint and the solder to the opposite side. When the wire is hot enough, the solder will flow into the joint and the wire wrap. Let cool and clean all the flux off the wire and solder joint to prevent corrosion. Once the solder joints are completed and cleaned. Go back to the attachment tabs securing the landing gear to the bottom of the fuselage. Apply a little flux and some solder to lock the gear wire in place. This prevents the gear from sliding side to side should the screws loosen during flight. Adding the wheels is the final step. Be sure to come back soon so I can show you how to make brass tube axle bearings for smooth running wheels and scale looking cotter pin attachment points. Thanks for the “how to”. I am currently building a 1973 Bud Nosen P-51 “kit” and this is where I am now-landing gear. This is very helpful, thanks! I am on the way to the shop to “go bild something”.